Look at this stack of fabrics. So lovely it almost hurts my heart. They are from the Good Folks collection from Anna Maria Horner. 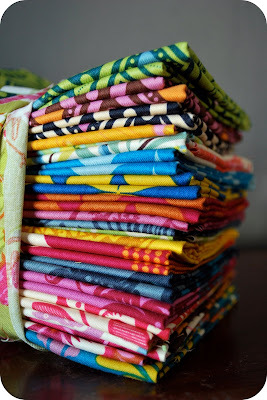 In a fit of ardor, I purchased fat quarters of the entire collection--all 24 heart-wrendingly beautiful fabrics. 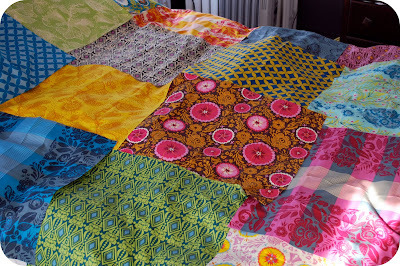 You see, I came across Anna Maria's blog (her home is too devastingly lovely) and then her fabrics and then I was in love and knew I had to have a quilt made from these fabrics for our bedroom. But, I don't quilt. Not that that deterred me, as you can see, from purchasing the fabrics. As soon as the fabrics arrived, I tore into the box and laid them out across our bed, just to see how they would look if they were to be assembled in the aforementioned quilt--and , I think my heart sang when it saw all those fabrics together, against the backdrop of our dark gray walls. This is the quilt of my dreams--if only I can manage to make it a reality. And dear Chez Beeper Bebe readers, I am scared. I have never ever made a quilt, and what if I screw it up? Gods knows what sort of desperate state I would fall into if I ruined all that otherworldly fabric and worse yet, this quilt would never grace my bedroom. So, I turn to all of you for your advice and assistance. Please tell me, where are the best resources for how to make a quilt? Books? Blogs? Other Resources? And if you are already quilters and know a thing or two about this elusive craft, what are your personal tips? What sort of batting is the best for this sort of project? What should I do for binding? What about backing it? I would be in a state of paralysis with all this lack of knowledge I posses on the subject, but dammit if I am not determined to make this quilt and have it in my bedroom. So, let me tell what I am envisioning at this point: I want to make this quilt with big square blocks of the fabric (somewhat like pictured above)--because I think the fabric itself is the superstar of this quilt, and more importantly, I need to start simple or I will never have the gumption to make this. And I have this idea that I would quilt it by hand, quilting around varying bits of the patterns in the fabric--creating this sort of mosaic of quilted patterns. Is this a bad idea? Am I doomed for failure if I go down this path? What don't I know that I should? Please help me. I am so utterly clueless. I mean, I sew things all the time, but somehow this feels like I am about to attempt to build the the space shuttle in my bedroom--because it is that important to me. Anything you can do to help will result in my eternal gratitude. There are LOTS more but that's just a few! you can do it!! you must do it!! Those fabrics are just perfect for a large quilt with large squares! maybe 10" or 12" and you can join 2squares to make a simple four patch! and welcome to the quilting world! Oh - I'm so excited for you! That's going to be one beautiful quilt! Here are my recommendations. . .
1. I'm with you about those big, beautiful blocks - let that fabric sing! If it were me, I'd piece them together exactly as you have them laid out on the bed - they look amazing. 2. Hand quilting is beautiful and I love to do it, but to be perfectly honest, you probably won't be able to SEE all that work on those lovely patterns. Hand-quilting really shows well on solids or fabrics that read as solids - if you know what I mean. I speak from experience here - I've hand-quilted many quilts with really rich patterns, but you can only REALLY see the quilting work from the back. Which brings me to. . .
3. Quilting. Using the print of the fabric as a guide for your quilting is a great idea and one I recommend in a class I teach called Quilting Without Marking (I hate marking quilts and I'm always terrified the marks won't come out). If you go that route I recommend using a solid fabric on the back - you can always flip the quilt over occasionally and show off that beautiful quilting. Also be sure that your quilting is pretty evenly spaced over the quilt. You don't want one area where your quilting lines are pretty close together and another area where there are large areas of unquilted fabric. The quilting actually draws up the fabric a bit and you want to make sure it's drawn up evenly - otherwise your quilt becomes lopsided. If you decide to machine quilt I would just do something simple and geometric - maybe a simple grid. But I'd go for the hand-quilting - it's so much fun and gives you extra time to spend with those luscious fabrics. Whatever you do - baste like crazy first. I use those bent safety pins for basting and it works great. 4. Binding. Don't even try machine binding. There are all kinds of sites out there showing you how to do that and I feel like I've tried them all, but nothing beats a beautiful hand-binding. I have a tutorial here. http://gratzindustries.blogspot.com/2007/05/tutorial-how-to-bind-quilt.html It seems like a lot of work but I find it really meditative and it might be my favorite part of making a quilt. The results are so worth it. 5. You asked about batting. I use Warm & Natural cotton batting and I love it, though I've heard that a wool batting is a dream to quilt with. I've just never been able to afford it. Some people say don't hand-quilt with 100% cotton, but I've never had a problem with it. I'm eager to try one of the new bamboo battings, but I haven't had a chance yet. I hate polyester - it doesn't drape s nicely as cotton and it can "beard" through the fabric. Ick. 6. Don't forget to pre-wash your fabric. It will make a big difference. how fun for you! i became obsessed with making a quilt after finding some of the aforementioned sites - beware - do you need another obsession??? :) look at filminthefridge.com - she has done several with anna's fabrics. check out their flickr pages,also. http://www.filminthefridge.com/2010/01/05/anna-maria-horners-playground/ have fun! soulemama just made a patchwork quilt using anna maria flannels. just big patches of fabric just like yours. she also made one out of good folks. she just sewed those envelope style and tied both of those quilts, so no need to worry about quilting or binding! I suggest purlbee, oh fransson, and crazymomquilts for basics on quilting. and for batting, definitely use warm and white or warm and natural. Oh good - I'm glad to see other people have already recommended the sites I've found helpful. I think sewmamasew has a lot of tutorials from their quilt month a couple years ago. I like the Denyse Schmidt book for the first chapters (you don't have to use the patterns, necessarily), and Amy Karol's bend the rules sewing has the first quilt I made - she's good about letting you know what you need to do and what you can skip. You can do this! I haven't ever taken a quilt class in real life and now I make them all the time. The only thing I find a little tricky is the basting, which I usually use pins for now and either stretch over a table or lay as flat as I can on the floor. Those are fabulous fabrics! And there are a few things you can do to make a really simple quilt. First, just solid blocks will get old really fast, and there are a few really simple and free(!) quilt patterns available online, including one designed by Anna Maria Horner herself ( http://annamariahorner.com/Folk.Dance.by.annamariahorner.pdf )that I am personally planning on making. Also, any local quilt store will have cheap classes you can take, and all the ladies that work there will be really excited to help a first time quilter. I suggest a going specifically to a quilt (as opposed to a fabric) store, such as Bernina or any of the many others as everyone you will encounter will be an expert. I wanna do it because Julie from Joy's hope inspired me too! I say bust open your copy of "Last-Minute Patchwork & Quilted Gifts." I believe your blog is where I first learned about this book and I have been loving it since! Even if the patterns didn't work for what you wanted, there's so much information about quilting techniques that it would be like someone holding your hand the whole way. Good luck--I envy your fabric purchase! I agree completely with Sarah...I'm working on finishing my first quilt and I learned sooo much from Sew Mama Sew and the awesome tutorials from OhFransson. I would DEFINITELY recommend practicing with a smaller scrap quilt to get the hang of working with the batting, especially if you're going to use your machine to do the quilting. I also just bought a bias tape maker for the binding and I can't tell you how fantastic it looks using some of the patterned fabric from the quilt for the binding too. If you havent already decided on a pattern, I would definitely look at Amy Butler's patterns. They are surprisingly easy and they flow really well with those bright colors! Oh, and I'm so jealous of your fabrics that I might have to just go buy some for myself. I'm thinking a quilt for my future (fingers crossed) little girl's room!! Hope you have a blast seeing your masterpiece come together! I too am a beginner. I've made exactly one quilt (I had never sewed anything to completion in my life). The quilt I made was an oversized twin quilt that had a very simple pattern. It was just blocks made using 4 squares to make the larger block. I paid a lot of attention to making sure that the blocks were all the correct size for my finished vision. Then, I called my sister (an expert sewer). She helped me sew the blocks into a window pane setting, that I think is very forgiving for beginning quilters. Bless her heart, she also sewed the binding. I guess I would recommend this to be a good approach for a beginner. Find that expert sewer who can help you through the more technical parts. I'm no expert, but I have made a couple of small quilts, completely by hand. I say: cotton batting, hand binding, Denise Schmidt book, you could even tie it and it would look awesome (as mentioned about Soulemama), go for it--you rock everything you do, have fun! It's going to be gorgeous. xoxo. If you want easy, you can sew the big blocks together just as they are. Just how you have them laid out. Right sides together. 1/4" seams. Then ppress the seams open. Then once you have all the rows complete, sew the rows to each other to finish the top. Then stick some batting in between (yumm cotton!). No suggestions on binding as I hate it and try to avoid when possible (so I like quilts without it!) And then you can do embroidery floss ties at each corner and in the middle to hold it all together. It would be quick and easy! all I have to say is if I can quilt, I KNOW YOU CAN DO IT - I generally leave the binding up to my mom (I am not into all that hand stitching)but everything else is quite easy if you keep it basic. 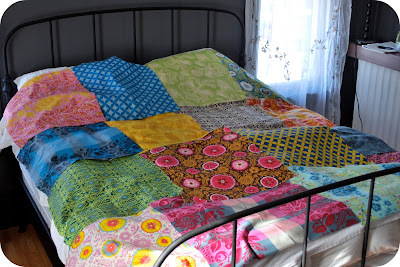 I have only made 2 quilts in my life, and for both I used a pattern called "Crazy Eights." Super easy to follow, and to sew - check out what patterns JoAnns has.........good luck! Anna Maria's fabrics are indeed beautiful! The book, Material Obsession, has a quilt that I am going to make using several of the same fabrics as you have chosen. It's a great beginner project using 18" squares of beautiful fabric and simple sashings. Warning: Making quilts is very addictive. You will fall in love. Also, if you don't love actually quilting the quilt, you can have someone else quilt it for you. Oh my, I almost bought that entire collection as well! You can do it! Can't wait to see the end result. Lovely fabrics....I love Anna Maria Horner, too! I have been quilting for years but I remember how nervous I was to cut apart the fabric for my first one :) Be sure to take the time to be precise when you cut out....no matter what pattern you choose, your blocks need to be accurately cut so they don't turn out wonky. My go-to pattern for fat quarter quilts is called Yellow Brick Road. It is very easy for beginners and my go-to pattern for fat quarter quilts. Since you plan on the quilt on your bed (as opposed to a decorative wall hanging) I highly recommend having your finished quilt top and backing professionally machine quilted on a long arm machine. I always choose a batting called Request...it is warm and lightweight. And definately hand sew the binding....machine sewn binding always looks tacky to me. I hate to hand sew so I always treat my mom to a girls day out in exchange for her sewing my binding! Lucky me :) Best wishes on your first project! I know how you feel! I went through the very same thing. And to be honest, the first quilt I made (which has a bundle of things wrong with it! ), is still my favourite. I started a little blog for just that reason - I wanted someone to give me the basics on how to start something like this - so I did my best. Feel free to check it out, if you think it might help:) www.craftyneo.com. Good luck - those are gorgeous fabrics, I'm sure you'll do a wonderful job! everyone had spectacular advice for you! my comments are to remember that you are an excellent sewer. don't choose a fussy pattern, if you choose a pattern at all. nobody said a quilt has to be perfect, i prefer the relaxed look to my home made items. i took a beginner class at a local quilt store and was totally intimidated by all of the talk about precise measurements, exact sewing, matching corners etc... i still had the bug so i decided to go for my own style. you have a lovely style of sewing and creating. just trust your inner sewer and your eye for color and sew those big squares together! it is a lovely look and very satisfying. there are many patterns for a similar look that you can peruse for suggestions. sewing is fun!! make quilting fun too. I'm doing the quilt along that Sarah (the first commenter mentioned). It's just starting and Randi is giving easy to follow step by step directions and lots of photos. I sew a lot, but this is my first quilt. I made my first quilt last week just to see if I could do it, and you know what...I did! I got one of those quilt kits from the fabric store and now I'm about to begin a rail fence block quilt out of a jellyroll I bought. I've seen your site before and you do great things on here. I don't think you'll have much trouble. Good luck. ok so i can't help you out with any advice what-so-ever because i too have never sewn a quilt! but i do absolutely LOVE your fabric that you bought... it's beautiful, it's gorgeous, i'm so envious. and here's a wonderful shout-out of thanks to everyone who posted such great helper links! i've gained a lot of courage to do my first quilt now because of all your help! my first foray into quilting was a rag quilt...which i suppose isn't a quilt at all, but it required some of the skills that quilting does and was relatively easy and gave a fabulous result! Check out some of my tips, tutorials, and free quilt patterns - www.rachelcox.blogspot.com. It's easy. And once you start, you may never stop! I should have mentioned - there is a sewing category on my blog - just look to the right side and scroll down! Thanks to all of you leaving comments and for your words of encouragement as well as recommendations for quilting resources--I have been visiting some of the sites, doing some reading and research and am starting to wrap my head around the fact that I may indeed be able to do this--although how long it will take me, there is no telling. Will keep you all posted on my progress...and thanks so much again. The way blogging can connect people never fails to amaze me. The most important thing to remember is that it's just sewing straight lines, nothing difficult. You can do it! If you are looking for a book with a pattern for a quilt with just squares (and other lovely patterns) you might take a look at Material Obsessions. It has a quilt made from big squares in it. Good luck! Everyone has left you excellent advice. I just want to say - don't worry, you can do it, even if it's not perfect and even if you don't do it the 'right' way, you will have a quilt you love and that is what you really want, right? I'm one of those people who hates reading directions, and I'll tell ya - I have made some baaad quilting decisions. But have I had any baaad end products? Nope. Each one is a learning experience. Okay, I have never used polyester batting, and that might be the one thing I would warn you against. But other than that, just have fun. Everything you make is gorgeous anyway - your quilt is bound to be lovely. I love love love these fabrics too! Putting them all into one big, simple quilt and letting the fabric do it's stylish thing is a fantastic idea. I love to quilt, self taught, began like you. If I had all that beautiful fabric to work with, I might go a bit modern. I'd do lines. Different lengths in random order. I, too had never made a quilt until a couple of months ago. I tried making one (using wonderful Amy Butler material sent all the way from the US) and was dejected when the quilt sandwich didn't work - the poor patchwork lay dejected in my study for months until I came across Of Fransson. This blog has been mentioned by others and it's great (and the tutorials work!). I have since made the Mod quilt from the quilt along and dream about sewing wiggly lines with my machine! Have fun - take the plunge! If you want to take a class, Crafty Planet up in NE Mpls has a beginning quilting class that is fun and easy, and they teach you all sorts of good stuff that makes it easy to go off and try all sorts of designs on all the great quilting blogs. Not at all intimidating, and you learn lots of great tips from them that I haven't seen on many of the web tutorials, or that didn't make sense until I saw them do it in person!